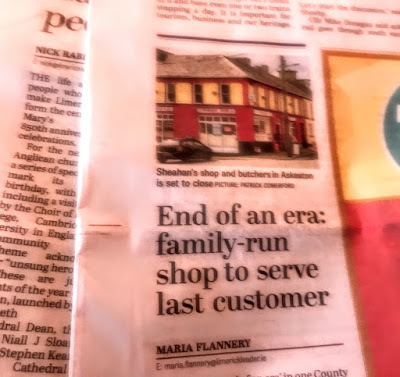 In this week’s edition of the Limerick Leader [3 February 2018], my photograph of Sheahan’s shop and butchers in Askeaton is used to illustrate Maria Flannery’s news report on the shop’s imminent closure, ‘End of an era: family-run shop to serve last customer’ (p. 7). 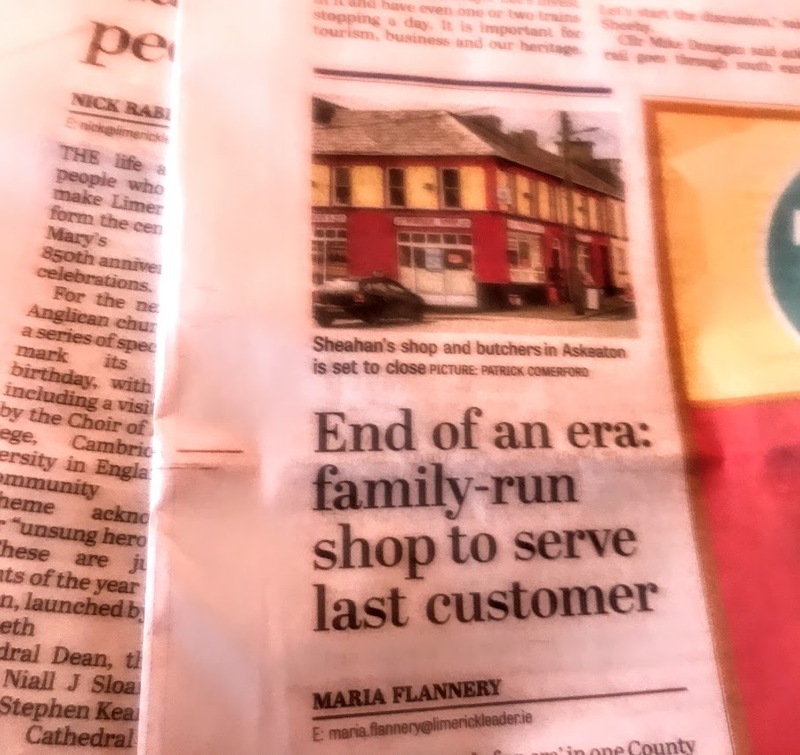 Sheahan’s Korner Shop and Butcher, a brightly-coloured shop in West Square, has been running for more than 50 years, but is closing at the end of March . Tom Aherne’s column, ‘Then & Now’, in the Limerick Leader this week is headed, ‘Page turner is a walk down memory lane’ (p. 17). He is writing about ABC News 2017, the latest edition of the annual magazine of the Askeaton/Ballysteen Community Council Muintir na Tire. ‘There is a three page interview with Canon Patrick Comerford who moved into the Rectory in Askeaton earlier this year. He arrived at the invitation of the Bishop of Limerick Dr Kenneth Kearon. He is also in charge of the neighbouring parishes of Rathkeale, Castletown (Kilcornan) and Kilnaughtin (Tarbert). He has four churches to look after, as well as his other priestly duties. He is a native of Rathfarnham in Dublin, and a former journalist with the Irish Times in mid-seventies. He was a late vocation, being ordained in 2000 for the Diocese of Dublin and Glendalough. He has settled in well in Askeaton, and likes to go for walks by the banks of the Deel and the Shannon Estuary.